My energy is high, as I leave the Bear Lake parking lot, heading to the Fern Lake trailhead, 9 miles away. Walking along the eastern portion of the lake, I feel relieved to get away from the people who are milling around the trailhead. Wanting to be alone, I energetically, and often rudely pass by less-adept hikers. An ever–so-gentle breeze caresses my hair, forcing me to look up. There, hands cupped over my eyes to protect them from the morning sun, I see three popped-corn shaped clouds floating lazily above Flattop Mountain. I am grateful for this moment, and look forward to many more of them today. If only people would leave me alone. Sounds of my size-15 hiking boots crunching the small rocks on trail interrupt the moment. Each crunch awakens my muscles. Every step activates my lungs. The fanny pack—containing a jacket, windbreaker, lunch, and water—settles on my hips. 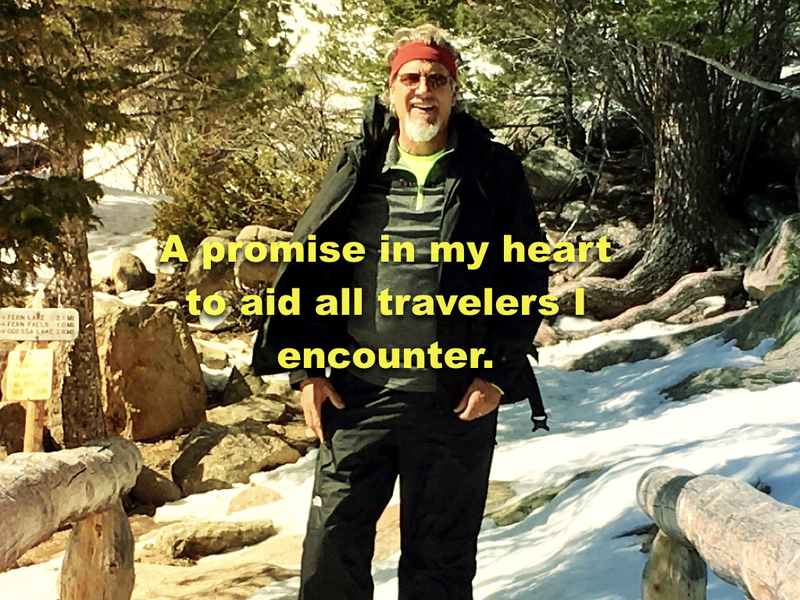 I am energized, and eager to hike. 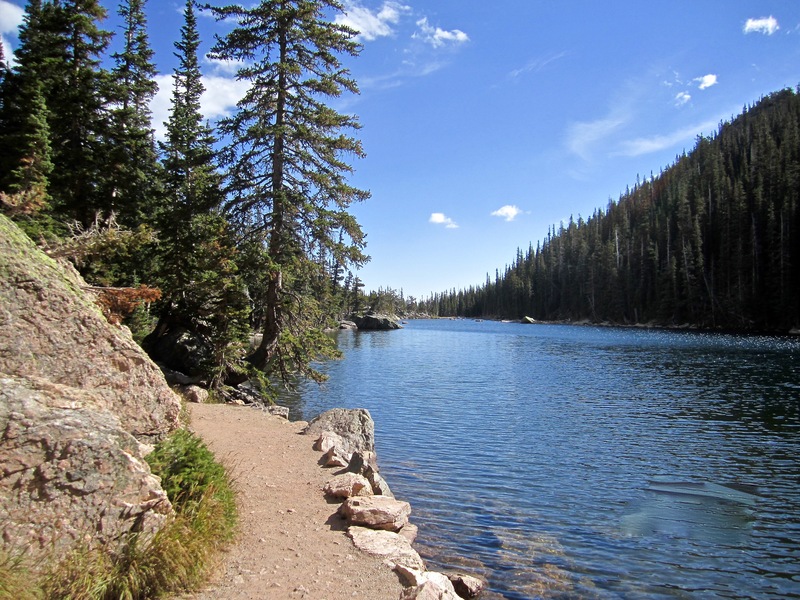 At a fork in the trail, I head eastward to Fern Lake. I am alone, finally. The trail steepens. As it does, my cadence slows, breathing intensifies, and leg muscles burn. One switchback follows another, each steeper than the last. My shirt becomes wet from exertion. Sweat stains the brim of my hat. It runs down my forehead, mixes with the sunscreen on my face, and drips into my eyes. Making them burn like hell. I pause to tend my eyes, breathe deeply, and drink water. Looking down, over the edge of the trail, I know I should appreciate the majestic view below of Bear Lake, but do not care. Miles to go, I forge on…alone. Up another switchback, then another, alone, I trudge on ever so slowly. My head throbs, back hurts, and legs ache. Doubt joins me. Why am I hiking this trail? What am I trying to prove? Can I even make it to the Fern Lake Trailhead? What if I do not? I am pondering these questions when the trail narrows as it crosses a field of boulders. They are still with me when the trail takes a sharp rightward turn. On one side is a massive granite wall, the other, a precipitous drop. The footing is treacherous. Mind numb, I slip, but catch myself. Damn, that was close. Scared, depleted, no energy to spare, little hope, I seek comfort on a rock. Sitting there, I drink water. Eat four fig bars. Rub my forehead. As I do, doubt keeps me company. What to do? Should I turn around? Thump, thump, thump beats my heart. Every breath is like sandpaper on my parched lips. Standing up, I feel a twinge of energy. My steps seem lighter. Breathing is less strained. As I forge on, hope joins doubt and me. Further ahead, I see a large olive-colored snake winding along the trail. As the snake gets closer, I am relieved to realize that it is seven girl scouts, each in an olive-green scout uniform, each wearing a large, same colored backpack. All are whistling, a happy tune. Stepping in perfect cadence. As I pass the first girl, the tune jumps into my head. When I pass the second, the tune goes from my head to my lips. By the time I pass the seventh girl, I too, am whistling a happy tune. I notice that hope is also whistling, and doubt is lagging behind. They, like the other people I encounter on the trail, come from where I now go. Their tune and lively steps lift my spirit. Whistling, with renewed energy and a lively cadence to my step, I come upon a young man resting against a rock. I can tell from his countenance that doubt has found him, his energy is spent, and he is confused about what to do next. Whistling the happy tune, I walk by him. Our eyes meet. I give him a big wink, nodding my head in his direction as I do. He nods back. Then sits up. In this moment, I feel the commonality of our respective journeys. Understand that he is me. Our struggles are the same. Walking on, I look at the majestic mountains. 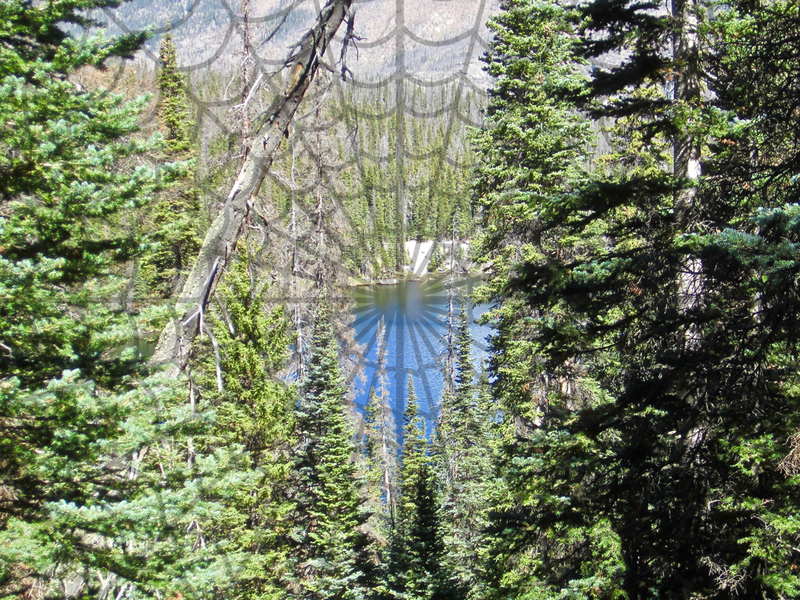 Catch a glimpse of Lake Odessa, far below the trail, in amongst the trees. Listen to the roar of a nearby stream. Let the shimmering leaves of the aspens mesmerize me. A strange, warm feeling—unlike anything I have ever felt before—arises from deep within me. It permeates my being, rejuvenates my legs, relaxes my mind, soothes my lips and eyes, and helps me see clearly. I look around. Doubt is gone. And hope is heading back up the trail toward the young man whom I just left. From this point on, every hiker I encounter along the final stretch of the trail gets a smile, nod, or kind word—sometimes, all three—from me. I have learned the lesson of this trail. I now see that each gesture, however small, is a conveyance of hope, an antidote to doubt, a soulful balm. 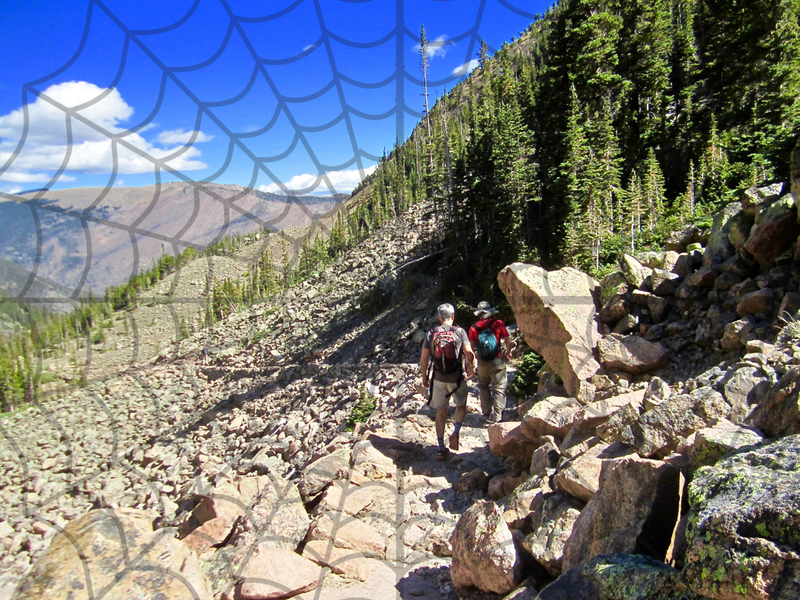 Each encounter is part of an intricate, yet ever-expanding web of positive energy. All fuel the warm feeling within me. I understand that a nod received leads to a nod given. A smile begets other smiles. On it goes, endlessly, hopefully. What you need, give. What you get, pay forward. Driving away from the trailhead, I look at Flattop Mountain in the rearview mirror. I think about the mountains I am meant to climb. That many of them are within me. The trails to their peaks often wind through valleys of despair, across streams of struggle, and have dark clouds of doubt. Having learned the lesson of the trail, I now understand that while my mountains are unique, my struggles are not. Struggle is common. It is, when we connect others, where we find hope. Let’s pay that forward. 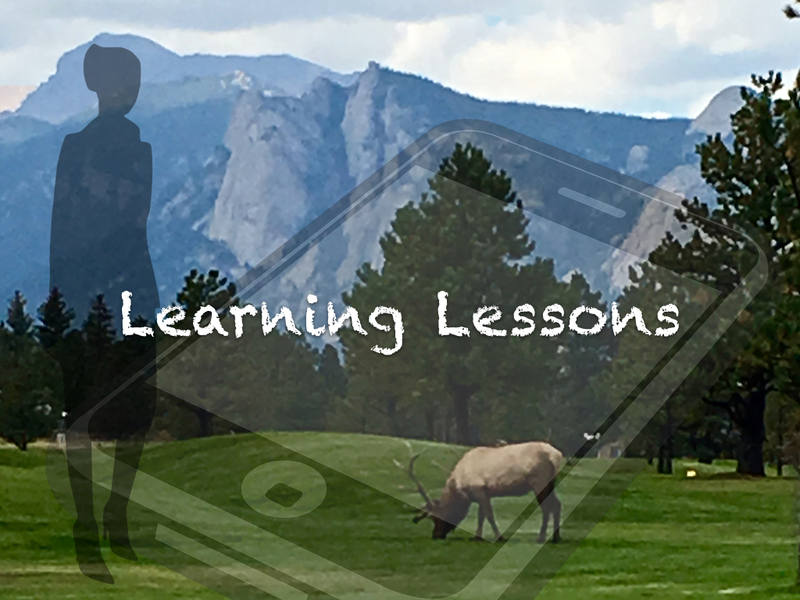 Note: This is the 15th post in the Learning Lessons series. Please click the subscribe button on the right side of the blog page to be notified of future posts. February 27, 2016 March 15, 2016 Mark E. Weston, Ph.D. In Rocky Mountain National Park, eight miles from the turn-off at Colorado Highway 36, Glacier Gorge Trailhead sits by Bear Lake Road, 9240 feet above sea level. As far as trailheads go, this one is quite spiffy. Its paved parking lot, four solar toilets, and double water fountains welcome our arrival. At the lot’s highest end, near the toilets, is big topographical map with a bright yellow you-are-here-arrow. In the shadow of the map stand, we lace up our boots, smear sunblock on nose, face, and neck, and don our daypacks. Sacred place here we come. The first section of the trail is down hill. This deception of ease deludes me not. I know that our destination lies amidst the ragged peaks that loom in the distance. So every downward step taken now will later require me taking ten or more steps up. I let worries about the path ahead, and the everyday troubles that came with me subside accepting the beams of the warm sunlight and caresses of the gentle breeze. Each step and every breath the trees and trail, rocks and birds offer their hospitality. A cotton-ball cloud punctuates my every glance at the blue sky above. Soon, where the nearby stream rushes downward, the trail turns upward. My pace slows and breathing deepens. Sweat and sore muscles push concerns about work and family out of mind. Step by step, breath after breath I slowly ascend the trail. Chipmunks crossing the path mock my sweat-soaked ascent with their sprightliness. Climbing—step, breath, another step, and another breath—the z-shaped trail pulls me up the mountainside. A mile in, a thunderous roar ahead wakes me from my step-breath drudgery. The wondrous sound pulls me to the cool spray of Alberta Falls. Crashing 30-feet down a small gorge, the falls energizes Glacier Creek and provides me brief comfort. Onward—step, breath, the trails pulls me upward. On my one side, rocks and pine trees, on my other, a breathtakingly beautiful panorama. It is 50-miles deep and at least that wide, glorious evidence of our magnanimous creator. As the sky gets nearer, trees become sparse, and air gets scarce, in the distance, Loch Vale rests at the base of 13,153-foot Taylor Peak, its glacier kissing the Loch’s shoreline. To the south stands 12,668-foot Thatchtop Mountain accompanied by 12,829-foot Sharkstooth on the southwest. The trail pulls me along is the Loch’s lengthy shoreline. A trout darts to and fro in the crystal clear water, searching for its next meal. As I come around to the north side of the lake, 13,208-foot Powell Peak reveals itself towards the south. At the far end of the Loch, a fallen tree marks the end of the trail. Here by the water, where mountain meets reflection, is the perfect place for a much-needed lunch break. As I chew on some trail mix, two chipmunks, a marmot, and a camp-jay-robber lustily look at my bag of nuts, chocolates, and raisins. Apparently this is their perfect lunch spot too. Leaving the Loch, path replaces trail. It leads up a solid granite base with a steep grade that severely tests my balance and strength. A bit later, a stretch—213 feet gain in 0.15 miles—makes me beg God for air. Around Timberline Falls, I ascend beastlike on all fours. 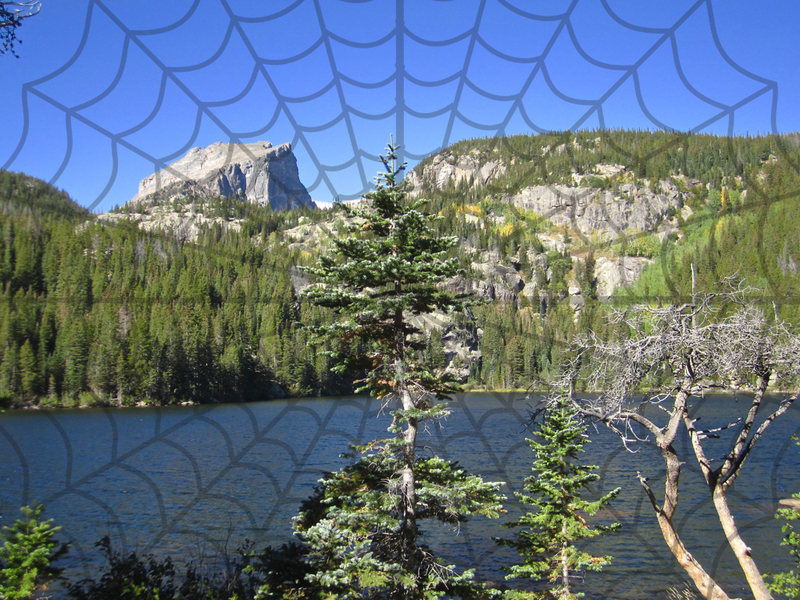 The reward for my efforts is the incredibly beautiful Lake of Glass, with its spectacular views of the Sharkstooth, Taylor Peak, and Powell Peak. Skirting around the west side of the lake, the path becomes more rugged. The final leg of my journey will be the toughest so far. I am tired, hungry, yet strangely elated. My destination awaits—Sky Pond. 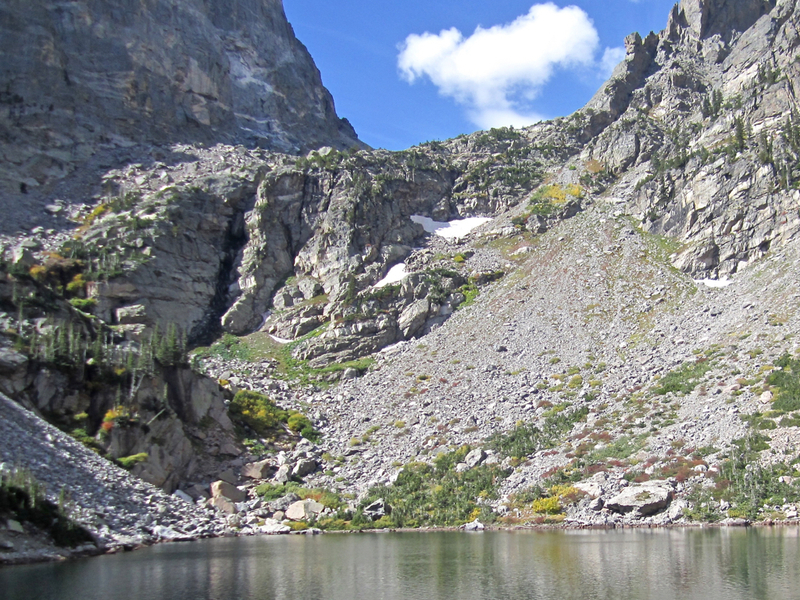 At 10,900 above sea level, Sky Pond occupies a cirque basin with sheer cliff walls on three sides. Its fourth side offers a spectacular view of the Loch and beyond. I do not come here often. But when I do, I do not come alone. A question comes with me. Here, at Sky Pond, I explore the inner contours of my soul. Answers to my most difficult questions live here. This is a sacred space for me. As I settle in, near the water, facing the cliff walls, the gentle Breeze sweeps refreshingly over me. Its second sweep drawing forth these questions—What am I to do with my life? Have I completed what I’m supposed to accomplish? Can I retire now? 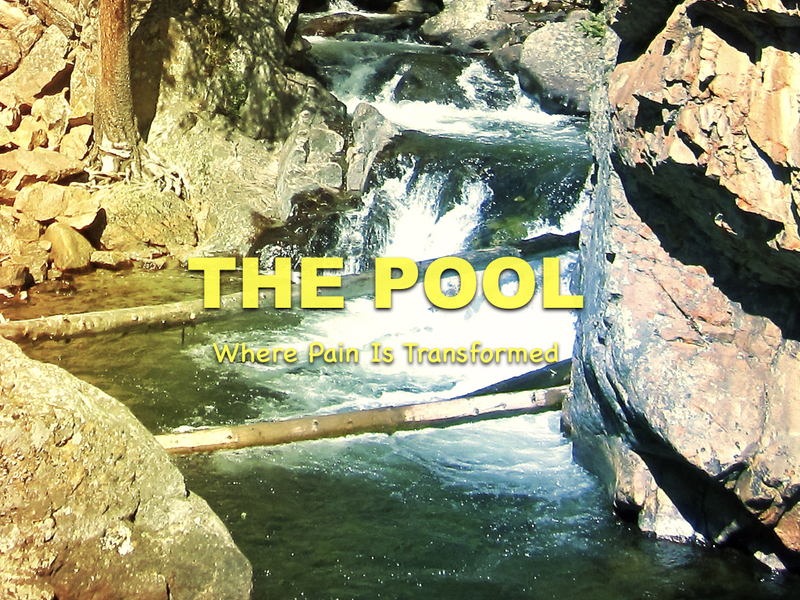 Grateful for the teaching provided me, I pay heartfelt homage to Sky Pond and its occupants. As I stand to leave, looking around at the cliffs and Loch, feeling the Breeze, seeing the Grin, and being kicked by the Wink, I understand that while this place is sacred, an equally sacred place is within me. Note: This is the first post in the Sacred Places series. Please click the subscribe button on the right side of the blog page to be notified of future posts. In the deep recesses of my mind, tucked in a well-protected crevasse is Heartland. Memories of my boyhood reside there. It is a place where a boy’s picturesque view of his world makes time stand still. I do not often go there, but when I do a warm memory always welcomes me. Let’s go there now. A memory of my boyhood is waiting for us. Northwest of the town square, past the bank, water tower, and United Methodist Church a modest, two story white house rests on a corner lot. My friend John’s aunt lives here. On the west side of the house, an enclosed stairway leads to a second floor apartment. With eager anticipation, John and I climb the steep stair steps. At the precise moment our feet touch the top step, a “C’mon in boys, there’s work to do” greets us. Waving us in, fussing with his wavy white hair, cigarette dangling from the side of his mouth, a leprechaun-like man scurries about the room. On its far side sits an easel. Near it, stretched canvases sit blank and ready to go. Further away stacks of paintings—trees, rocks, stately elk, and snow capped mountains—await completion. Scattered about, on wooden crates, are several half empty coffee mugs. An unhealthy amount of milky tan-colored scum floats in each. By the easel bunches of tubes of paint, brushes of every possible size, and three paint-pocked palettes of differing hues are ready to go. A not quite vacant bottle of amber liquid completes the bohemian décor of the apartment turned makeshift, winter studio of Dave Stirling, Corydon’s finest artist. Even though Mr. Stirling grew up here, Bugscuffle Ranch Studio on the Horseshoe Park side of Rocky Mountain National Park, Colorado has been his home since 1915. He is the park’s one and only artist in residence. At the ranch, most days (and many evenings), he holds court, often playing the piano as he spins tales and charms potential patrons. Holding court leaves Mr. Stirling little time to paint. So most of the paintings he sells there, he paints here, sometimes with our help. Perched on wooden crates, John and I are ready to go. Mr. Stirling tucks a fresh-lit cigarette between his lips, grabs a brush, mushes it into some purple paint, points to the canvas on the easel, hands me the brush, and says, “Mark, paint a letter…any letter.” Leaping off the crate, to the canvas I go. With a bold stroke, S is the letter I paint. “Now John, you paint a letter, any letter,” says Mr. Stirling. John puts a precise P on the canvas. While we return to our perches, proud of our contributions to the effort, the maestro adds his strokes to ours. A horizon appears. Stepping back, he asks for our guidance. 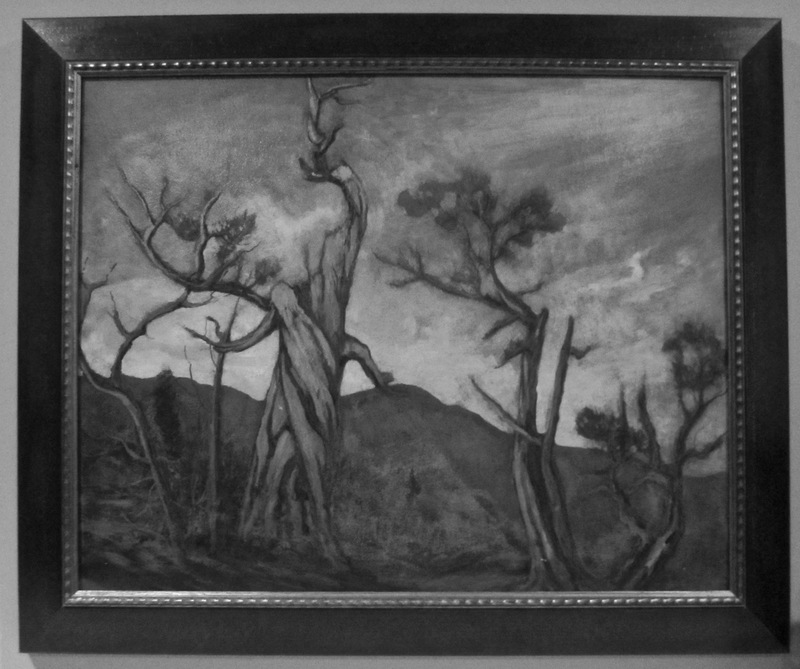 We offer critique, he considers, then adds more strokes—brown ones, ochre too—a tree springs to life in the foreground. Splotches of blue, dabs of white become a blue sky with billowy clouds in the background. After more strokes, and an extra bit of critique, we stop. Twisted, leafless trees on a mountainside under a blue cloud-filled sky. A signature—Stirling—in the lower left corner completes the painting. As we bask in the glory of our masterpiece, Mr. Stirling regales us with stories of his childhood in Corydon, the circuitous journey that took him to Bugscuffle Ranch, people he met along the way, and his life as an artist (and tourist attraction). His words become brush strokes, his life a canvas, experiences a palette. The stories he tells and pictures he paints depict the joys and sorrows of a man living the life he wants to live within the boundaries of our hometown and the national park but outside norms and mores of each. We are born a blank canvas that is ours to paint. Using a full palette we paint our lives with the colors and hues we select and the textures, contrasts, and shades we experience. The combination of paints and brush strokes create different effects on our canvases. For instance, bold brush strokes and bright colors bring passion and drama. Broad strokes and earth tones portray purpose, steadfastness—one’s lifework. Not surprisingly the wide range of colors and brush strokes—including John’s P and my S—Mr. Stirling uses are wholly consistent with the unrestrained way he lives. In my Heartland there are many characters, some bolder and more colorful than others. Their artistry is evident in the beauty they extract from the ordinariness of everyday life. The way they live inspires and guides the strokes, texturing, and shading of my life. On my life’s canvas there is a bold S stroke honoring Mr. Stirling, a reminder that talent can fill a canvas with beautiful images, but it takes a little flare and a dash of audacity to bring the images to life. Note: This is the sixth post in the Heartland Series. Please click the follow button on the right side of the blog page to be notified of future posts.